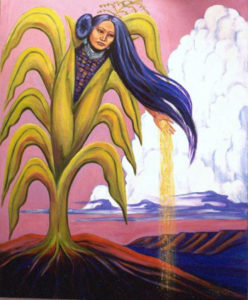 Colorful illustration of a Native American woman growing from a large ear of corn. It was 1994 and I had plenty of assignments, but the research I was doing had nothing to do with them. I was trying to answer a question that had been gnawing away at me for some time. 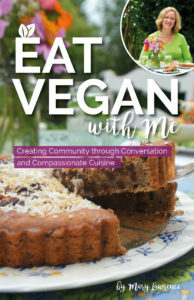 I had been a vegetarian since my early twenties and, as a member of the Oklahoma Choctaw Nation, had always wondered how important of a role meat played in the diet of my people before the onset of European influences. Research had shown me that a vegetarian or vegan diet was certainly natural for the human body. From our teeth to our gut, we are designed for a plant-based diet, just like most of our distant primate relatives. Was such a diet part of the history and culture of my father’s people? It wasn’t just curiosity that drove me; it was my health. Like so many American Indians, I was battling obesity. Some studies have shown that when people of any race identify the plant-based foods that have traditionally been central to the diet of their ancestors, and then add them back into their diet, it helps to control weight. I knew that corn, pumpkin, and beans were the mainstay of the Choctaw diet, made into a daily stew and eaten with bread made from corn or acorn flour. But what about meat? What I learned surprised me. Meat was rarely consumed among my people before 1492. Just as tobacco was smoked briefly only during ceremonies, meat was eaten infrequently. It isn’t easy to kill a rabbit with a bow and arrow. And it wasn’t necessary. The native peoples of the Americas have been described as the greatest farmers in the history of the planet. Nearly half of the plant foods grown worldwide today were cultivated first by New World Indians, including sweet and white potatoes, many kinds of beans, nuts, berries, and fruits. Three of the most popular flavors in the world, chocolate, vanilla and strawberry, are all gifts from America’s first farmers. They concentrated their genius on agriculture in part because they did not have domesticated animals to eat. The only domesticated animal in North America was the dog. A few tribes had domesticated the turkey, but that was primarily for their beautiful feathers. They also did not have horses to ride or iron-making technology to make heavy-duty cutting weapons. And they had no gun powder, guns or rifles to take down large prey. Hunting large or fast animals and processing them is difficult without these inventions. After 1492, meat slowly crept into the menu of all tribes because it was suddenly easy to catch and kill all kinds of animals. Further, the introduction of domesticated animals like sheep, goats, cows, chickens, and pigs made meat and animal products accessible without hunting, and metal axes and blades made killing them and using their hides much easier. 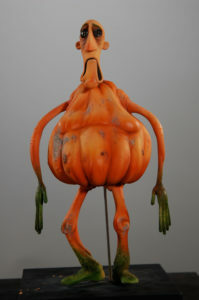 Claymation figure of Father Pumpkin from the movie Coraline. When the Spaniards noted that the Aztecs, Mayan and Zapotec people enjoyed life spans twice as long as theirs, they did not attribute this to the diet of these tribes. But the native healers knew about the link between food and health. The children ate only plant-based foods for the first decade of life and when illness struck, were advised to return to the arms of Mother Corn to encourage wellness. Sadly, wisdom seems to have failed us as a people when we embraced the new flesh-filled diet of the West. But consider that imported diseases like smallpox, bubonic plague, measles, whooping cough and influenza killed 80% of the people in the New World after Columbus landed, and then it is easier to understand. We’ll never know exactly how many people were here in the late 15th century and what the total death count was, but modern day estimates from the most knowledgeable sources consistently put the Native American death toll at 80 to 90% in the first century after the Europeans landed. That means that 80% of the elders and the healers and the wise ones died, too. It was a devastated group of nations trying to survive the loss of their people, their land, and sometimes, trying to survive war, that chose to adapt to the new ways and adopt many of them, instead of resisting. These diseases and others common in Europe but not as deadly for Europeans raced ahead of settlers and settlements wiping out millions of people before non-Indians ever saw the native communities or learned of their culture. Native villages weakened by one disease were easily wiped out by a second or third that swept through the surviving populace. It was the remnants of once-great cultures that settlers saw, and they didn’t even realize it. Had this holocaust not occurred, or had the native people been able to record their histories in books and libraries before the plagues struck, we might know a great deal more about how and what various tribes ate on a daily basis and during special celebrations. We might know, for example, if there were tribes that could have used more animal products but chose not to. But instead what we have are some oral histories and observations from non-Indians, mere bits and pieces of information. Thankfully, there was enough information to make a case that at least some Indian nations ate little to no meat on a daily basis 500 years ago. So in 1994, I gathered up what I could find and put all of this research into an article entitled “Returning to the Corn” and it was published in Vegetarian Journal that same year. Cartoon of a smiling green bean against a sky-blue backdrop. Almost immediately, reprint requests began arriving, and then requests by local and statewide vegetarian organizations for me to come and speak on the same topic. Online, the article has appeared on dozens of different non-profit sites. To this day, I continue to receive reprint requests and “fan mail.” None of my articles or books has had an impact that comes close to that article. Apparently many other people had also wondered about how the diet of the Old World changed America. The New World was not a vegan utopia prior to 1492. However, in hindsight, it is clear that certain activities and inventions sent the Old World in one direction and the New World in another. The lack of domesticated food animals, horses, guns and iron-making technology steered the New World toward agricultural development and away from meat-eating. The daily intake of most people was primarily plant-based, and meat in the form of fish or small game was typically, depending on the tribe of course, infrequent. Life spans were longer and the number and diversity of food crops was amazing when compared to the Old World. Some Europeans thought they’d landed in the Garden of Eden; for example, the Indians had carefully cultivated 47 different varieties of berries over the millennia. American Indian nations have worked hard to maintain their individual cultural identities. Many have classes where the native language is taught. There are gatherings where the ancestral dress is observed and the old dances and songs are repeated. Books are written with the old folk tales and the tribal histories. But there are areas where many native people continue to blindly follow the European way and the daily diet is one of those. Many of us do not even know the name of our own ancestral core crop. No one can change North America back to the healthier and more animal-friendly place it was five centuries ago but each of us can look for ways to help animals and ourselves, and to minimize the negative things that happen to them, and to encourage peaceful behavior. You don’t even have to be a vegetarian or a vegan to do that. First, investigate your own background and the core crops of your ancestors. Try to incorporate them into your diet at least a few times per week and see how that makes you feel. Then look around and see how you can help the animals who live nearby. You can volunteer at an animal shelter, foster a dog, adopt a cat, plant something to encourage wild birds, bell the neighborhood cat, put up a birdhouse or a bat house, donate to a wildlife fund, or simply go online and type in the name of your city or state after the question: “How can I help animals in…” You will pull up a whole 100 list of non-profits eager to avail themselves of your time, energy or donation. We may not be able to change the entire world, but we can change the little piece of it where we live—for the better. Rita Laws is a Choctaw living in Oklahoma with the youngest of her children plus two dogs. She holds a PhD and MS in psychology and a BA in education. Dr. Laws has been a freelance writer since the 1980s when she left teaching to stay home with her family that was growing rapidly through adoption. She writes primarily for parenting and hobby magazines and has written several books.